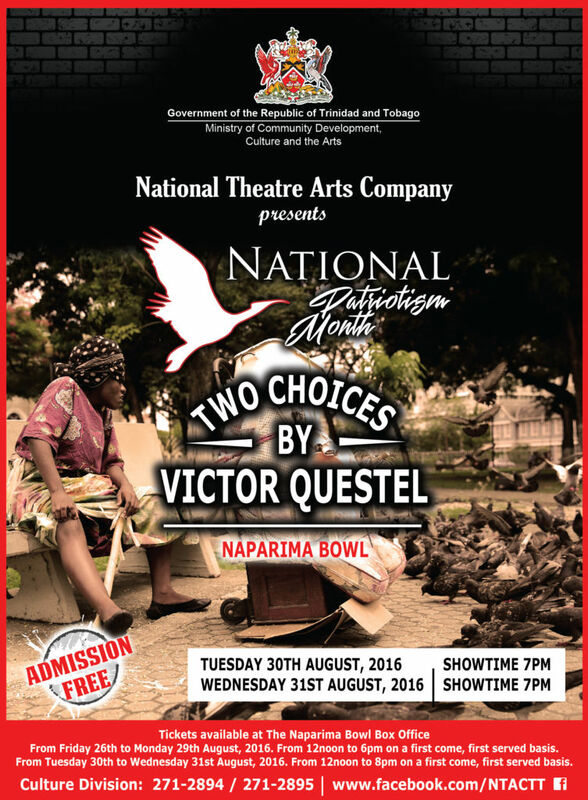 To celebrate National Patriotism Month the National Theatre Arts Company presents Victor Questel’s play “Two Choices” at the Naparima Bowl in San Fernando on Tuesday August 30 and Wednesday August 31, 2016 at 7:00 pm on both nights. The play is written by Victor Questel and directed by Belinda Barnes, Artistic Director of NTAC. Admission is free but ticketed. Tickets will be distributed at the Naparima Bowl Box Office from Friday 26th August from 12pm – 6pm daily. Trinidadian poet and playwright Victor Questel grew up in Gonzalez, Port of Spain. He first garnered literary attention in the late 1960s, as an undergraduate at UWI, St. Augustine. Under the guidance of mentor and close friend, Professor Gordon Rohlehr, Questel became the first student in the Department of English to be awarded a PhD for his critical research on the work of Derek Walcott. Questel was committed to making a significant contribution to our culture as a poet, essayist and playwright and wrote tirelessly about the Caribbean experience. His three poetic collections — Score (1972), a co-publication with his friend Anson Gonzalez, Near Mourning Ground (1979), and the posthumous Hard Stares (1982) — trace an arc of growing confidence in the craft of words but also of increasingly piercing confrontation with the demons of politics, family, and faith. Questel felt it his sacred duty to preserve the poetic art form, taking upon himself the mantle of “keeper of the word”. As a dramaturge, he wrote a selection of plays which include Improv, Countdown, One Man and His Dog as well as Two Choices. His deep love and commitment to his art form helped foster relationships with other cultural greats including Derek Walcott, Leroi Clarke and Earl Lovelace to name a few. Despite his growing esteem as a poet and writer, Questel never lost touch with his humble beginnings. He was a beloved father and husband, who nurtured a profound appreciation of art within his children. He entertained them with his readings and dramatizations as well as introduced them to the work of icons such as Andre Tanker, Louise Bennett and Edward Brathwaite. Questel’s death in 1982, at the young age of 33, was a major loss not only to his family and friends, but to the wider literary world. In his wake, he left behind a small though powerful legacy, establishing his rightful place as a masterly Caribbean poet and writer.